Effect of moisture on the performance of LiNi_(0.8)Co_(0.1)Mn_(0.1)O_2 YE Mao;YANG Feng-yu;LU Cheng;QIAO Min;Tianjin Sinopoly New Energy Technology Co. 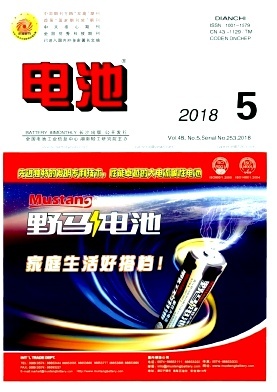 Analysis of aluminum foil structure for Li-ion battery MEI Ming;XIANG Qian-xin;ZHU Qiao-feng;QING Jun-jie;Shenzhen Zhenhua Electro-chemical Co.
High rate performance of Li-ion battery prepared with Al_2O_3 coating PE separators LEI Jing;ZHU Dan;RONG Liang-bin;ZHANG Guo-heng;Shenzhen Optimum Nano Energy Co.
Effect of pipeline optimization on leakage current of aluminum-air cell stacks LV Zhi-yong;PAN Zhou;WU Xue-feng;CHEN Peng;Wuhan Huanda Electronics science and technology Co.
Validity evaluation of industry standard Lithium Nickel Cobalt Manganese Oxide CUI Yan;LI Hua-yi;China National Institute of Standardization;CITIC Guoan Mengguli Power Source Technology Co. Discuss on welding technology for cylindrical battery combination QI Jia-jin;SU Fang;LI Xiang-zhe;ZHOU Bin;Hangzhou Dayou Science and Technology Development Co.